Almost any type of computer is usable, as long as it is running some version of Windows, Mac OS, Mac OS X or Linux. We recommend you to use a reasonably fast computer, since re-warping images and blending them are quite CPU intensive. A slower computer just means a longer wait, though. See Extended bracketing control on how to extend the limited bracketing capabilities of your camera. With wider angles of view fewer shots are needed to capture a complete scene. Fisheye lenses are typically used for creating immersive 'spherical' panoramas, whereas longer focal length lenses are more normally used to create cylindrical panoramas as it is much harder to assemble the large numbers of tiled shots these require to cover the zenith and nadir (top and bottom) of a complete spherical panorama image. In order to assist with setting up your lens and camera there is a Entrance Pupil Database with relevant dimensions. Any fixed focal length lens would be best for maximum quality. Most zoom lenses suffer from non-standard edge light fall-off (vignetting) and from heavy lens flare. Consumer zoom lenses often perform badly in terms of contrast, sharpness, maximum aperture and chromatic aberration. Lensbaby Circular Fisheye Circular fisheye lens with manual focus, 185° field of view For Canon and Nikon APS-C cameras. It has a reflective ring inside the barrel of the lens for "flare" effect. Use f8 and higher to reduce flare. 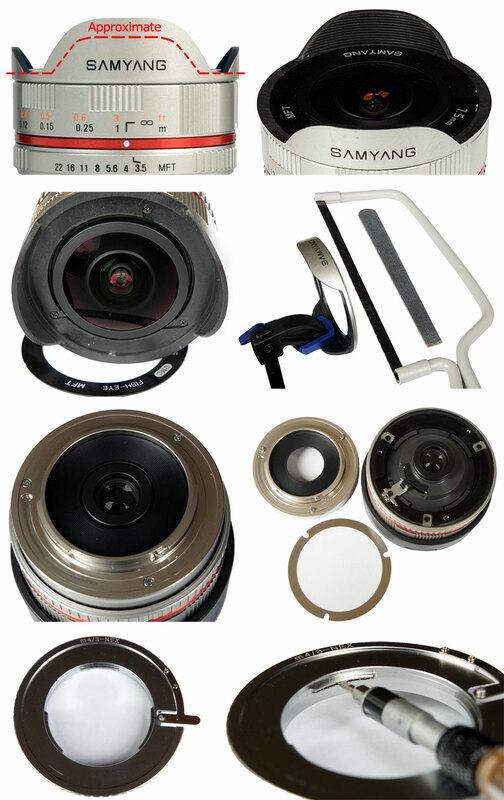 Samyang 7.5mm MFT full frame fisheye lens with manual focus, 174-177° diagonal field of view on Micro Four Thirds sensor. Can be adapted to APS-C sensors such as Sony NEX with a mount adapter and shaved hood for circular image. Samyang 8mm/f2.8 Series I & II full frame fisheye lens with manual focus, 176-178° diagonal field of view on APS-C sensor for mirrorless cameras. Can be adapted to Full Frame Sony Alpha with a shaved hood for circular image. Sigma 4.5mm/f2.8 The first 180 deg. Circular Fisheye Lens exclusively for use with APS-C size digital SLR cameras. Yasuhara Madoka (E) 180 Circular fisheye lens with manual focus, 185-190° field of view Sony E-mount mirrorless cameras. My current favorite tripod for shooting panoramas is the manfrotto 755b. The tripod is extremely strong, tall, and incorporates a ball head that can be used to quickly level a head - though this does require somewhat of a 'knack' to get the hang of. Essentially, for just over $200 you can get a really large, strong tripod, with levelling feature. Only downside for me is the weight, but I cannot justify spending 3x the price to get a carbon fibre version! When combining multiple images, it is critical that each image be captured from the same point of view. This optical center of the lens is commonly called the nodal point, although it is more correctly referred to as the entrance pupil or no-parallax-point. The no-parallax-point is usually located inside the lens; in the wide angle lenses used for panoramic imaging, the entrance pupil tends to be near the front of the lens. A standard tripod mount rotates the camera around the mounting screw in the camera; the simplest no-parallax-point adapter simply shifts the camera back to move the lens's no-parallax-point over the axis of rotation. More complicated brackets allow the camera to rotate vertically around the no-parallax-point as well as horizontally. With lenses that produce a large image circle, it is possible to capture a number of DSLR frames for stitching into a large panorama. Typical lenses that can be used for this purpose come from Medium Format, and Large Format (4x5) camera systems. A stitching adapter is typically used on a Large Format camera to provide precise XY positioning of the DSLR camera, so that all the image tiles are taken in the plane of focus. In this type of system, since the capture device (DSLR Camera) is moved, but the lens is not; there is no requirement for determining the lens no-parallax-point. However the panorama must be stitched as an orthographic projection. Have a look at iSiteMedia's Pano flash - made from an old studio flash and an opal garden light. NOTE that by now (Dec 2008) the cost of flash memory cards has dropped so much that these portable storage devices are now a rather expensive solution in comparison to buying a few more memory cards. This plus their need for battery power (which can be problematic if you're not near power sources) means that they are no longer the wishlist item they used to be. Click to see an alphabetical list of panorama related hardware manufacturers. This article is out of date. You can help Panotools Wiki by expanding it. See the related Talk page for hints. This page was last edited on 6 November 2018, at 17:30.